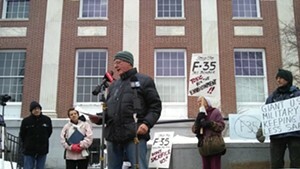 Ben Cohen speaks out against the F-35. 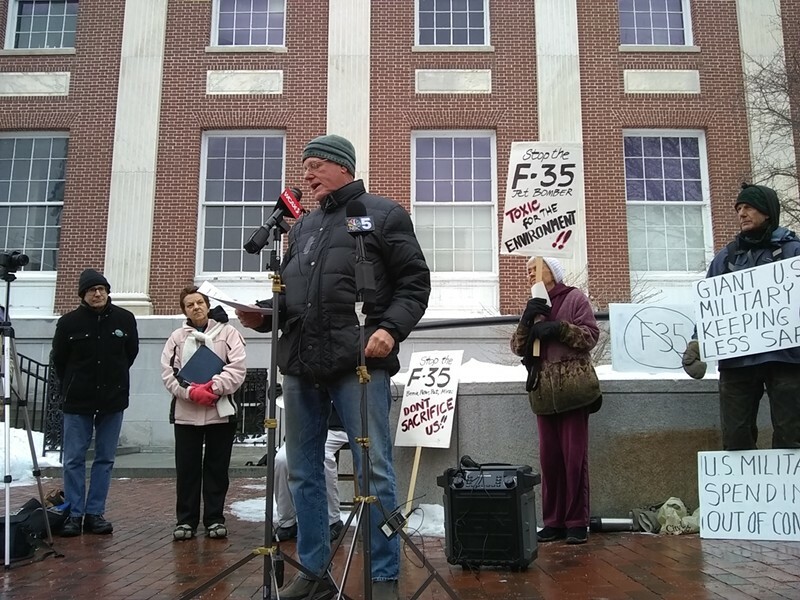 Opponents of the decision to base F-35s at Burlington International Airport collected 2,700 signatures — nearly 1,000 more than required — to put the question to Queen City voters on the Town Meeting Day ballot, members announced in a press conference outside City Hall on Friday. 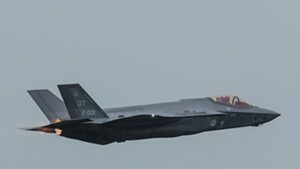 The advisory question, which must be approved by the city council to be on the ballot, asks voters to "advise the city council" to cancel the planned basing of F-35s, which are scheduled to arrive at the airport's Air National Guard base in 2019. The ballot item asks if voters will "request instead low-noise-level equipment ... appropriate for a densely populated area." Charles Simpson, a Ward 6 candidate for city council, said the successful petition drive marked "a glorious day for democracy." Simpson said there is a need to halt the home buyouts in the Chamberlin neighborhood in South Burlington, prevent "intolerable aircraft noise" and the "wholesale degradation of our vital housing stock." Behind him, supporters carried handwritten signs decrying the jets as "toxic for the environment" and responsible for "climate destruction." "When there are situations that threaten us, and put our safety at risk, put our children at risk, put our lake at risk, we take action," said Rachel Siegel, executive director of the Peace & Justice Center. The fight against the F-35s has been a longtime battle. Some of the same opponents, along with the city of Winooski, unsuccessfully sued in 2016, arguing that the U.S. Air Force had not conducted a thorough environmental review of the basing decision. Even if voters support the measure, the question is nonbinding and can force no change. 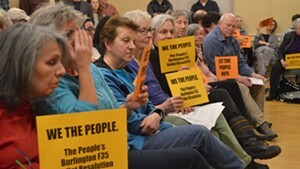 An affirmative vote could urge the Burlington City Council to vote to halt the arrival of the jets, or it could pressure Senators Patrick Leahy (D-Vt.) or Bernie Sanders (I-Vt.) to intervene, said Rosanne Greco, a longtime F-35 opponent. Greco contended Friday that the City of Burlington does have the authority to stop the jets. "Because Burlington owns the airport, they have the right to say what comes and goes from that airport," she told reporters. Burlington city attorney Eileen Blackwood did not immediately respond to a request for comment. 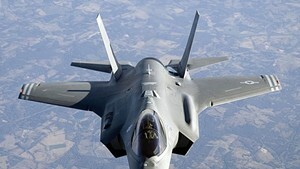 The council is scheduled to decide on January 29 whether to put the F-35s question to voters. If the council votes against it, the group will take the city to court, said Jimmy Leas, a group organizer. "The public wants to vote on it," Leas said. "Voters are what provide legitimacy to the process." 2) request instead low-noise-level equipment with a proven high safety record appropriate for a densely populated area?